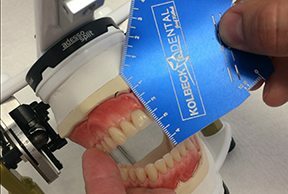 The OMP is an outstanding tool to help dentists determine and communicate specific functional and esthetic criteria for dentures. 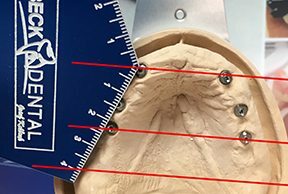 This has become especially important with the all-on-four protocol as a denture set-up for VDO and tooth position is required for surgical guide fabrication. 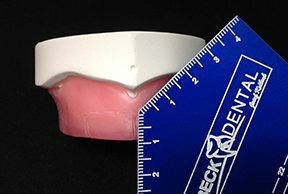 Developer of the device, Josef Kolbeck, has become a valued part of our implant/removable team. OMPs are available for purchase through the lab. 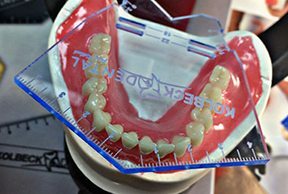 This entry was posted in Bay View Dental Laboratory, Custom Dentures, Dental Case Treatment Planning, Dental Implants, Treatment Planning, Uncategorized. Bookmark the permalink.